Are you a mom who is looking to save some time each day? Then you may want to consider investing in a bottle warmer. Today we are reviewing the Tommee Tippee Travel Bottle and Food Warmer. The Tommee Tippee Travel Bottle and Food Warmer has an insulated thermal container, which you pour boiling water into. The thermal container will keep the water hot. When you are ready to feed your baby, simply pour the water into the included bottle warmer. Set the bottle in it, and the bottle should be done very quickly. No electricity is required. This is portable, and works well when you are traveling. This is BPA and phthalate free. The bottle is not included. 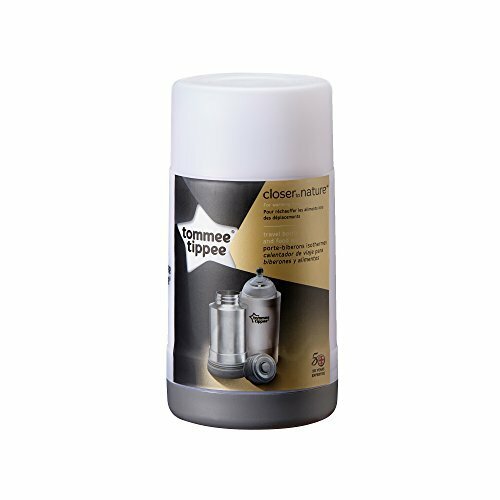 This baby bottle warmer has been specially designed for Tommee Tippee Closer to Nature Bottles. As of this writing there were 1,603 customer comments and 172 answered questions for the Tommee Tippee Travel Bottle and Food Warmer. I've read through the customer feedback, and then condensed the results into this review. I hope that this helps you when shopping for a baby bottle warmer. "EXCELLENT travel bottle warmer! We love this warmer and use it almost every single time we leave the house! The water stays hot for hours! The longest we have done is about 6-8 hours and each time, it is still piping hot and steaming when I pour it and it heats my daughter's bottle up easily in just a few minutes!" "Tried using it 3 times with warm water and each time the water leaked out into the white cap. Two times the water stayed within the white cap but on one occasion the water soaked the diaper bag because I didn’t secure the white cap properly." "I looked at many different products but chose this one as it does not require batteries, hot packs, or a car outlet. I can pour in the hot water and heat up the bottle anywhere, allowing me to feed my son at church without missing the sermon. I will probably purchase again for baby shower gifts. Highly recommend." "The only drawback I have found is that after I've heated a bottle or two and there isn't much water left in the thermos, it tends to not hold the heat in well. Because of this I have taken to just replacing the hot water in it when it becomes less than half full." "I have a baby who only likes bottles really WARM, which can be a problem when running errands or at a friends house who doesn't have a bottle warmer. I was really surprised at how well this worked!..It does take a couple of minutes to thoroughly warm the bottle (4-5 min. ), but it definitely does the job. Also, it keeps the water hot for at least 7 hours." The price of this bottle warmer is really great. Especially compared to other bottle warmers that use electric or batteries. The customer comments on the price were very positive. The Tommee Tippee Travel Bottle and Food Warmer is a grpriced bottle warmer that does the job without using electric nor batteries. It can work for 1 or 2 rounds of bottle warming and then it will start to lose heat. Customers reported that it will hold heat for approximately 7 hours. Then it will heat a bottle in approximately 7 hours. This bottle warmer is nothing fancy, and basically a thermos. But it does the job of heating bottles very well. I hope that my review of the Tommee Tippee Travel Bottle and Food Warmer can help you decide if this is the bottle warmer for you! For even more information, check out the rest of our bottle warmer reviews.